The glass used for windshield is not the same as the glass used for other windows. All windows in a vehicle are made of safety glass required by the OEM, however the windshield goes through an additional process of lamination to protect passengers. If you have damage to your Windshield in Minneapolis, do not let it get worse through the winter. St Paul weather can cause a lot of havoc on any auto glass that has a crack or chip because water can get into the crack and expand causing it to get worse very fast. Only 1 Auto Glass can turn your Minneapolis auto glass problem into a thing of the past by coming out to your location to do repairs while you are at your place of employment or in your own home. Tempered glass is glass that has gone through a tempering process of extreme heating and rapid cooling. This process makes the glass extremely tough, up to five times stronger than regular glass in fact. But it is not just its strength that makes tempered glass ideal for vehicles. When tempered glass does break, it breaks into small pebbles instead of shards. It is also referred to as safety glass. Laminated glass is made by placing a piece of plastic between two pieces of glass. The glass is then heated in an oven referred to as an autoclave. During an accident or other extreme that may break the windshield glass, the pieces will stick to the plastic therefor keeping the driver and passengers safe from shards. Windshield glass is made of laminated glass and the other windows in a vehicle are typically made of tempered glass. It is important for all vehicle glass to be tough and shard proof, however the additional layer of protection for the windshield is for protection from projectiles on the road. The three layers insure that most small items that come into contact with the window while driving will, at most, break the outer layer. This area is much more likely to be hit by debris and the driver who is in control of the vehicle is behind this area so it is vital to have this additional defense for the windshield. The safety glass on the rearview window and passenger windows is tough and will hold up in extreme conditions, however it does not need to be as resistant to road debris. All glass in a new vehicle must meet OEM standards. OEM stands for Original Equipment Manufacturer. The standards are set for every part of a new vehicle by the engineers who designed it. If you need an auto glass replacement, you want to continue to meet OEM standards for continued safety in your vehicle. 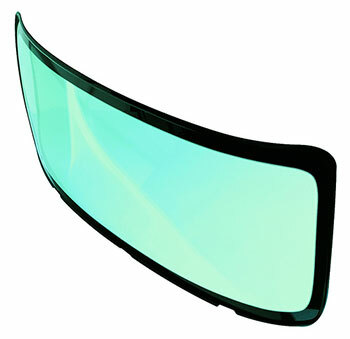 If you do not go with an OEM windshield, you will be choosing from aftermarket glass products. These can be just as safe, however you want to make sure that they meet standards set by the Auto Glass Safety Council to make sure that your car is as safe as possible. We are a registered company with the Auto Glass Safety Council, and we are a BBB accredited business. Customer satisfaction and safety is our number one goal, and we can come to your location day or night for a professional windshield repair or windshield replacement at your own convenience. We will meet all of your St Paul auto glass needs anytime. Contact us at Only 1 Auto Glass if you are in need of auto glass repair or replacement. We have a 24/7 call line for emergencies as an additional convenience to our customers.